In total, I watched 54 new-to-me movies in 2016, most of them at home, but a decent number in the theater. For this list I’ve focused on movies released late in 2015 or in 2016, so one of my favorite movies I watched for the first time this year, Make Believe (a documentary about magicians), won’t make the list. Rogue One: I loved Rogue One. I loved how it is its own unique story, but it still fits snugly into the main Star Wars story. I loved how it answers one of the huge plot holes from the original trilogy. I loved how high the stakes are–you know what I mean if you’ve seen it. And I loved that there is a non-Jedi character who believes in and uses the Force. Rogue One made me even more excited about spin-off movies in the Star Wars universe. Moana: I’ll be discussing this in an upcoming blog entry, but I think this is the best musical of the year and the best animated film. 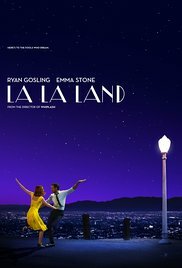 La La Land: After seeing the rave reviews and after learning that it was made by the same director as the stunning Whiplash, I decided to see this despite it being a musical. I rarely enjoy musicals because the ones I’ve seen have involved a lot of people dancing and singing in a way that seems completely frivolous–it doesn’t progress the story or character development. After watching the first scene of La La Land (it’s just a bunch of people dancing and lip-syncing on a crowded highway), I was really worried. But the rest of the film is a revelation, particularly the musical numbers, largely because (a) they progress the story and (b) they’re largely uncut. The tracking shots last entire minutes, allowing you to appreciate the skills of the actors (there are no quick cuts to mask their lack of skills). And it’s not just in the dance numbers. In many of the scenes focused on dialogue, shots last 15-30 seconds, if not longer, allowing the actors to really act. It also helps that the story is just wonderful. Arrival (related entry): I think this movie has the potential of being my favorite of the year, but I really wish the trailers had been less revealing. They show so many crucial moments of the film, moments that would have left a bigger impression on me if I could have seen them as the movie intended. I continue to watch fewer and fewer trailers for this reason, but I really didn’t know anything about Arrival until I saw the trailer. What were your favorite movies watched in 2016? See last year’s list here. This entry was posted on Sunday, January 1st, 2017 at 9:11 pm	and is filed under favorites, movies and tagged with movies. You can follow any responses to this entry through the RSS 2.0 feed. Rogue One was amazing for the reasons you listed. I loved the diversity of characters that didn’t need to be ones we knew. And Finding Dory had the years best laugh for me – the truck scene at the end was hilarious. I like that you mentioned the diversity of characters, Mike–I really liked that too. Rogue One was enjoyable, but I thought that The Force Awakens was a lot better, for me anyway. I definitely felt a lot more connected to the characters. Of course, it was neat how the ending of Rogue One brought you right up to the moments before A New Hope. I would also give the Force Awakens a slight nod over Rogue One (but probably more slight then you). I really enjoyed them both. I saw a number of small indie movies, but as for in-theater blockbusters, I only saw a handful, including Rogue One, Deadpool, and Kung Fu Panda 3…I know…eclectic. While I enjoy the experience of going to the theater, my girlfriend and I, and even my daughter and I often prefer lounging in pajamas and eating snacks (or sharing wine w/my girlfriend) as we watch a flick, so we tend to watch slightly older movies. Joe: What’s your favorite older (but new-to-you) movie you watched this year?